If Holmlid is going to claim muons, let him bring in someone who detects them for a living. I would expect as much of anyone else. This is not an unreasonable expectation. This is how most scientists working out of their field proceed. Review of Scientific Instruments (RSI) publishes novel advancements in scientific instrumentation, apparatuses, techniques of experimental measurement, and related mathematical analysis. Its content includes publication of regular and review articles on instruments covering all areas of science including physics, chemistry, and biology. RSI regularly publishes conference proceedings of two conferences, the High-Temperature Plasma Diagnostics topical conference and the International Conference on Ion Sources. Special Topic sections may also be published on new developments or on recently held workshops in instrumentation Review of Scientific Instruments covers timely reports on advances in instrumentation within areas of research that include: Optics, Atoms and Molecules, Spectroscopy, Photon Detectors, Particle Sources, Particle Detectors, Nuclear Physics, Fusion, Plasmas, Microscopy and Imaging, Condensed Matter and Materials Chemistry, Biology and Medicine, Gravity, Geophysics, Astronomy and Astrophysics, Electronics, Electromagnetic Technology, Microwaves, Thermometry, Thermal Diffusivity, Acoustics, Sensors and Actuators, MEMS, NEMS and General Instruments. For your sake, Keieueue, I hope you will find a way to get past the ad homs. They don't advance what argument you might have, or increase anyone's understanding, or serve the cause of truth and discovery. They just add noise that has to be filtered out. What's the point in debating something you don't believe in, since those somethings rely on unproven theories and paradigm changes yet not acknowledged? I think LENR is most likely real. I think nearly every explanation for LENR that I have come across is unphysical. I'm interested in knowing what's going on. That requires experimentation together with reasoned debate. I'm not in a position to do experiments, but I still take a keen interest in what's going on. You should try to apply greater discernment to the wild and crazy cast of characters on this site and others, as they are really quite a diverse group. And even those who are dead-set against LENR have some useful information and ideas to contribute. So you can't do experiments, but you want to find an explanation for something you pretend to believe in, using incomplete tools that cannot explain what's going on, as said tools can only be refined through experiments that will refine them to the point of modelizing precisely those experiments? If you think LENR is real, either you perform experiments yourself and refine theories / create new ones, or you give credence to those who perform them, and help them refine theories / create new ones. Wait a minute, isn't it exactly what you and your push-forward-a-seemingly-true-RL-identity pals been doing? So you can't do experiments, but you want to find an explanation for something you supposedly believe in, using incomplete tools that cannot explain what's going on, as said tools can only be refined through experiments that will refine them to the point of modelizing precisely those experiments? There are many physicists who wouldn't know what to do with a spectrometer. There are many business analysts that wouldn't know how to carry out a statistical regression. Surely few to no science journalists work at accelerator facilities or telescope arrays. Despite this, I think they add to the conversation. Are you doing experiments? If not, why not? This is ad hom. Here you're questioning my intentions, even after I've been quite straightforward about laying them out. The answers to your questions above do not have any bearing on my contributions to the LENR-related topics that are being discussed. Your questions just serve to cast doubt on my integrity. Why don't we leave it at this: you appear to think I lack integrity by claiming that I think LENR is probably real while arguing against it. Fine. Can we say that the possibility has been raised now and move on? There is one feature of this muon radiation that speaks against the idea that the radiation is fast electrons. These particles are emitted for days and weeks after the reaction is over. There is a storage mechanism where a delay in particle release happens at a decreasing rate over time. The production of fast electrons do not behave that way. There is also a time of flight delay going on where it looks like a decay chain of daughter particles are produced at distances from the particle source. This is true even in the after death condition. Fast electrons ionize the air as they fly through it at a constant rate and lose energy in a predictable way. These particles don't seem to be affected by ionization energy loss. Assuming that eros has a functioning LENR reaction going, eros has the chance to test all this out and set up tests that duplicate what Holmlid has found with regard to the behavior of these strange particles: that being particle production after death, time of flight particle decay, and ionization effects on particle behavior. And I'm not doing experiments, because I'm doing Internet Police. To each his trade! Why are you getting this upset? And yes you've been very straightforward in laying out your intentions: pretending to believe in LENR while dismissing all "fringe" theories and even those much closer to the current model, all the while mocking and undermining people who do work and research in the field. Yet, don't take it personally, there's a good dozen of your kind here, and you all act the same, in a spectrum going from "bad cop" Mary Yugo to "good cop" Jed Rothwell. Those two extremes even pretend to argue these days, as Jed Rothwell is trying to regild his public image and stay relevant as a pseudo-believer, in the propaganda game surrounding LENR. You don't lack integrity: you are very coherent in your cultist or even paid shill persona! I suggest you find another job! I doubt your approach has convinced a single soul, even ones quite sympathetic to your general worldview, of anything about anyone on this site. Why are you getting this upset? You're cute, Keieueue. That was me trying to help you discern ad hom from not-ad hom. In most serious scientific circles, mention of the word "ad hom" makes people pause. It does not appear to affect you much. 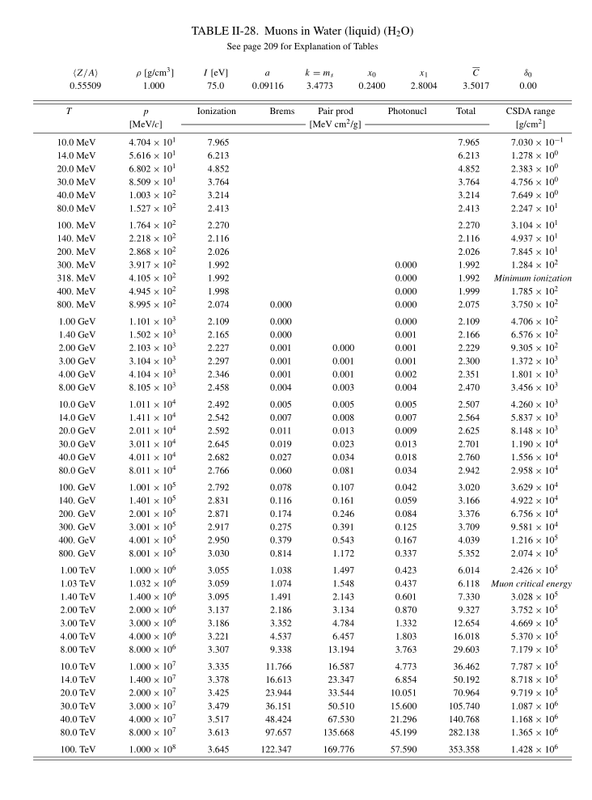 Hmm, if I look pages 10-11 pictures for emulsions / analysis data then I say tracks are from muons. And if they are right about energy then it is 1Gev muon. How much it leave for muon when proton decay? Need to study nuclear emulsions, maybe handy tool show/find muons (positive/negative)..
20-30w energy disappering/radiation have error marginal. Meter (pollucom es) have ~3w accuracy spec. But it is old and flow meter may have got some dirt, airbuble etc. I can also mention that once I put "wrong" stimulus to reactor it send something (feel head) and pollucom flowmeter stopped to rotate/register rotation (it have magnet + hall sensor, I think) pump worked as before. Situation hold ~30s, then I hand fibrate/rotated it and it started again register. And if summ all energy inputs and posible errors then maybe 0w loss. And maybe errors happens just when change things in reactor. So no 100% sure, but..
You are right. Lead is heavy, and can work out to be very expensive. How about building yourself some fishtanks? Water is an excellent shielding material for any radiation that might be harmful to life. You could even put some fish in there - in the same way canaries (birds) were kept in cola mines to warn of gas build-up. And glass fishtanks are also transparent - which could be useful. Look at a fish-breeders forum and they will tell you how to build cheap fishtanks using just glass sheet and silicone adhesive. Also Alains proposal, which I like much, doesn't help according to this paper. Conclusion there is no concrete shield for muons with high kinetic energy. May be we should calculate their energy first and use a high voltage plate condenser to deviate them! The post was edited 1 time, last by Wyttenbach ( Sep 9th 2016 ). 1 GeV muons will be stopped by 816.5 g/cm2 of lead. If you divide this by the density of lead (11.35 g/cm3) you will obtain the amount of centimeters of lead needed. That is almost 72 cm of lead. Here is another table for water: http://i.imgur.com/3R51kWk.png . If most of the energy was really due to high energy muons, containing it in the close proximity of the reactor would be a big problem. Muons at lower energies have a much lower range in matter. 1 MeV electrons have a range in iron (7.8 g/cm3) of 0.6159 g/cm2. Translated to cm, this is 0.079 cm. This information may become a building block for previous discussions in this thread. 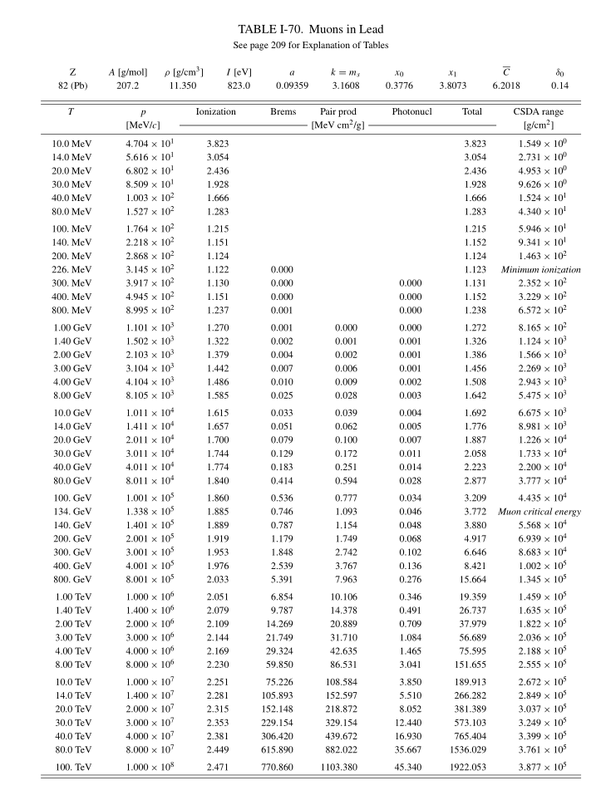 According that paper cosmic ray muons ~42cm Fe cuts 90%. Maybe adding B-field in Fe shield can bend slower muons slightly so they travel little longer in Fe, atleast when they are low energy B helps. So crude calculation ~60mm Fe 100, +40mm Pb 75, miinus BG say 20 do 80 and 55 so real drop ~1/3. So if I add ~20-25cm Fe and put some B-field circulating it plus 15cm borated H2O outside it is maybe 98% more safe? Duh lot of work and 20cm Fe if have ~25cm cavity inside length ~40cm weight near 2t plus H2O. Lab floor dosn't hold it + 100 more problems.. Anyway <1hrs work near give swet night again and difficulties to think clear. Without shielding can't continue or it can be last thing here..
Crude calculation/quess above. My meters are crappy chinese <40$ to do anything more accurate. And only anomalies are that wrapping GM tube with Cu tube give more counts outside shields as inside GM tube and working near reactor do ill. Not much / posible errors may be. HV plates are easy to do and if muons and have strigth fly from reactors can maybe do easilly. Broblem is that I can't work near. If most of the energy was really due to high energy muons, containing it in the close proximity of the reactor would be a big problem. If some portion of energy in lenr reactors escape in muons then shielding is broblem. Bigger broblem than fission reactors.. But it depends lot of muons energy spectrum / amount per Mwh. And them detection is not easy, so many experimentalist may have them but don't detect. Small amount don't harm, but when try to get some power out.. This information may become a building block for previous discussions in this thread. In the context of eros's experiment, 1 GeV electrons have a range of (5.678E+01 / 7.8 = 7.2 cm) in iron, and there is still the 4 cm of lead to traverse. If the choice is between ~ 1 GeV muons and 1+ GeV electrons, perhaps an explanation that involves neither electrons nor muons should be sought out? I note that eros is using GM counters. Perhaps he can find another method of detection to cross check what the GM counters are saying? The only guy who has used a cloud chamber in LENR experimentation is Piantelli. He detected a charged particle coming out of his nickel rod at 6.7 MeV. Piantlli thought that this charged particle was a proton the particle most likely was a muon. Just go outside, sun hurts some eyes.. And not looked direct reactor core there was Fe shields between so no XUV etc.. Inside GM tube never give much counts (only when take it outside shields counts rise (inside shields near reactor is less than BG with GM tube "eyes"!) it is like reactor mystically (ok, it is not mystic, it should do that if it is machine) eats some radiation BG like antenna eats RF). So hard to trust inside GM is defected. How if neutrons present, moderating neutrons with 2mm Pb + 60mm Fe, then 1.2mm Cu to GM? Disclose neutrons from reason need to change Pb pricks to ~20cm water canister? Water should cut neutrons >90% ? But not much if muons? Where I got strength enough to do that? If energetic protons? (primary reason ofcourse, but I think they decay inside). If high energy proton fly out how it behave? In piantelli patent is included picture. It fly stright, but there is no data is B field present(?) B should effect proton and muon. I am not expert to say what kind of track muon vs. proton leave such used chamber and such "calibration" data is not included in patent. Anyway if Ni kicks out muons how muons do secondary reaction in Li7 that are claimed / observed many times? Li7 muon capture can do Be7? But muon needs to slow first and that don't happen inside small reactor? In "lenr" working reactor Ni should kick out protons 300kev or more to hit Li7. Things are "wrong" if instead Ni kicks protons 1Gev level etc. to other protons / Ni. Too much energy level for economic P+Li producing reaction for 1000x. "launch" gun happens 1000x too slowly. It can do it if it is machine.. And functional reactor may sometimes grow that level if wrongly operated / have positive energy gains mechanimisim etc. How SMM mode, without stimulation? Inside GM tube never give much counts (only when take it outside shields counts rise (inside shields near reactor is less than BG with GM tube "eyes"!) it is like reactor mystically (ok, it is not mystic, it should do that if it is machine) eats some radiation BG like antenna eats RF). 1 GeV electrons (and muons) are extremely unlikely to be coming from your experiment. So hard to trust inside GM is defected. I'm wondering whether the GM counters are defective, and whether you're operating them in the right mode. A second method of detection would be helpful here. Also: moving the GM counters further away from the source and then closer, and seeing if there's a change in the counting rate. And interposing the shielding and then taking it away and seeing if there's a change in the counting rate. The way that particle physics produces muons is to first create pions. They do that by using a target where mesons interact with mass of the target to produce pions. The pions exit the target and decay into muons. The shield that eros is using may just be producing muons so eros might see more GM counts outside the shielding than inside the shielding. mesons have a very short lifetime. That makes them hard to detect. You assume that mesons are there when you detect their charged decay products (aka muons). When eros shields the mesons, he is creating muons. There is something strange. I assume it is some kind of radiation. It dosn't fit alpha/beta/gamma profile. Ofcourse errors are posible. Current best fit is ~120-150Mev muon that hits Cu tube GM. Other energies are posible / method not detect. Cu tube GM method give only small slice of negative muons. It give no idea about positive muons amount/energy or outside of moderation window energy negative muons. And if it is true then shielding is not easy task. Tests with maybe 0.1g fuel amount can do without serious healt broblem. I have maybe 30g fuel inside. Maybe amount that is near dangerous/deadly border..? 1J is something e-19ev, if I have say system lost power 10w and 1Gev level then 10¹¹ muons /s so is it posible danger or not? Muons come from pions, but they have so short livetime that dosn't fly outside reactor or? ?